The peer-reviewed journal Human Gene Therapy has granted its Pioneer Award to renowned cell and gene therapy researcher Malcolm K. Brenner, MD, PhD, from Baylor College of Medicine in Houston for his scientific achievements and leadership in the field of genetically modified T cells that can effectively target tumors. The journal is commemorating its 25th anniversary by granting 12 awards to researchers that study cell and gene therapy and publishing a Pioneer Perspective by each of the award recipients. Dr. Brenner, who is founding director of the Center for Cell and Gene Therapy at BCM, has dedicated his career to understanding how tumors avoid detection by the body’s immune defense system, and his Pioneer Perspective, entitled, “Gene Modified Cells for Stem Cell Transplantation and Cancer Therapy,” summarizes the greater achievements of his work to date. Brenner’s research has contributed to the progress of gene transference through retroviral vectors in the development of both autologous (AUTO) and allogeneic (ALLO) hematopoietic stem cell transplantation (HSCT) approaches to cancer immunotherapy. Brenner is also a pioneer in developing the technique of modifying T cells by stimulating their activation, proliferation, and anti-tumor activity through the use of chimeric antigen receptors (CARs). With a PhD in immunology, early in his research career he began to study the interaction of B cells with T cells to produce antibodies. Throughout his career, he has conducted research into the development of cellular therapies for the treatment of immune diseases, and is now studying bone marrow transplantation, also known as HSCT. His research team at Baylor has developed and tested an approach to improve patients’ immune recovery following T cell depletion while being prepared for transplant. “This work was the forerunner of our later efforts to improve antiviral and antitumor immunity by adoptive transfer of T cells,” Dr. Brenner explained. “Malcolm has been driving the field of cell-based gene therapy forward since its infancy. His contributions have been truly seminal,” said the Editor-in-Chief of Human Gene Therapy and Director of the Gene Therapy Program, Department of Pathology and Laboratory Medicine, University of Pennsylvania Perelman School of Medicine, Philadelphia, James M. Wilson, MD, PhD. The recipients of the award were selected by a blue ribbon panel of leaders in cell and gene therapy, which was led by Chair Mary Collins, PhD, MRC Centre for Medical Molecular Virology, University College London. The Award Selection Committee selected the winning scientists recognizing the devotion of their careers to cell and gene therapy research, as well as for their accomplishments and contributions to the progress of the field, including basic science or clinical advancements. 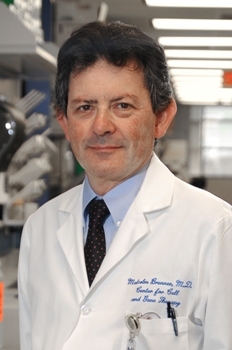 Brenner has also recently been awarded with the Pediatric Blood and Marrow Transplant Consortium’s Lifetime Achievement Award, a career recognition for being an example of dedication to research and education and to the improvement of the availability, safety, and efficacy of hematopoietic cell transplantation and other cellular therapeutics for children and adolescents. Dr. Brenner is the sixth recipient of the award.